"Wistaria" is a seventeenth century house. A pump with date 1611 used to stand in the kitchen which has unfortunately been removed in recent years. During the last ninety years the house has had many uses. It was owned, by Miss Hyde, who had a life interest in it., and was rented by George Holly. When the "Coach and Horses" was rebuilt in 1882 Holly, who was land lord, transferred the licence to "Wistaria" with a Miss Hillman as manageress. When he died in 1886 his son William, then living at "Granville House" took over the premises. He was already agent for the L.S.W.Railway Co. and transferred his horses and 'buses from the stables behind the Knap. He let a room, as branch office to the Wilts and Dorset Bank and later built an annex which was used by the bank; it was then taken over by Lloyds Bank until their premises were built in 1930. When Holly sold his buses to Morgan he became Postmaster. And for forty years "Wistaria" was the Post Office. William his eldest son, after an absence from Charmouth, returned to help his father. 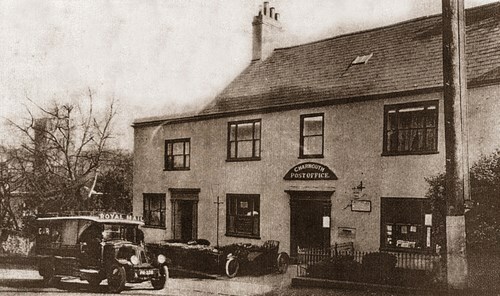 When the Post Office was moved to Coles' shop at "Devon Edge" on the death of William Holly senior in 1931 he opened a stationery shop. He died in 1953 and for a short while it was the County Library. The premises were purchased by Childs and Son, who transferred their ironmongers business and enlarged the shop. 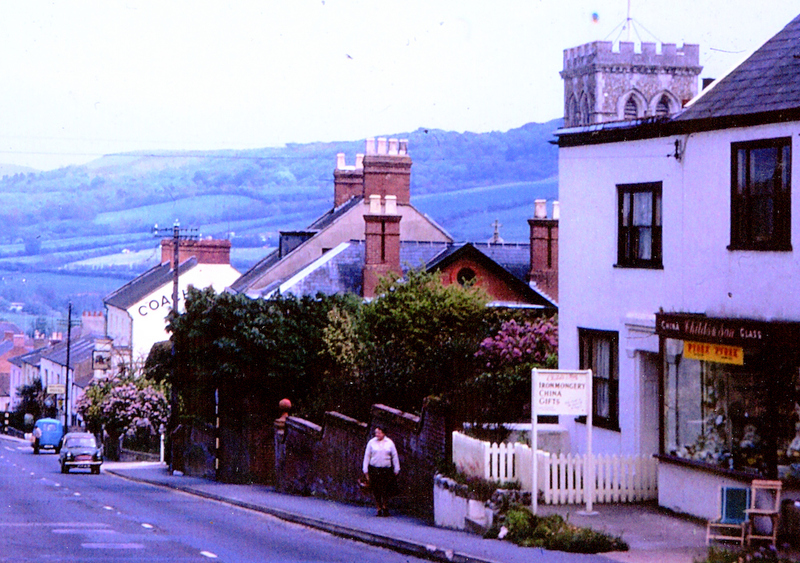 William Holly senior attended Charmouth Church School and on his way he sometimes "bought sweets from an old woman who lived in a cottage by the church. He was one of the first boys in the school to receive -in September 1864 - a certificate awarded under the Diocesan Prize Scheme. He spent several years of his active life in Charmouth, where he did important Geological pioneer work, especially on the detailed stratigraphy of the Lias shown in the cliffs east of Charmouth, and he was the first to give a detailed description of the Lias of the Golden Cap. His important work is published in the Quarterly Journal of the Geological Society. 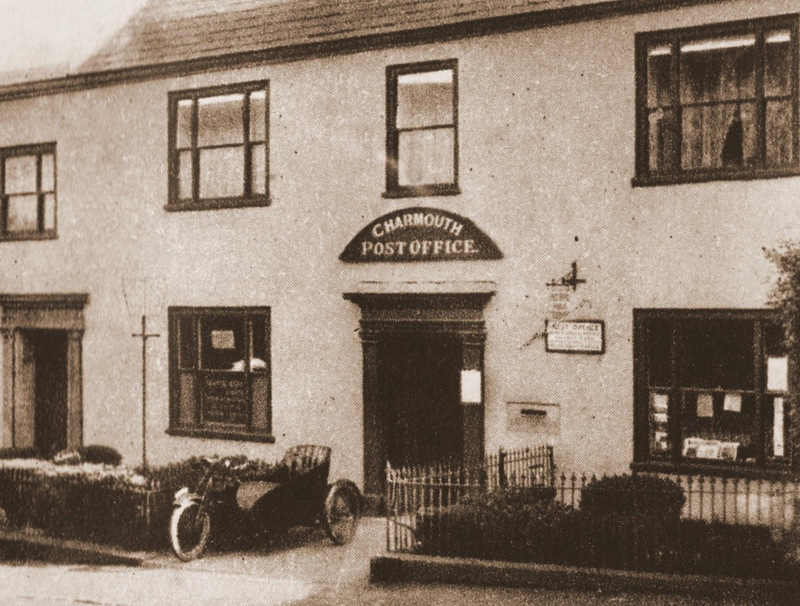 Douglas Board wrote in 1933” I remember Mr. Day living in Charmouth. He was there several years and lives in a house in the village that is now the Post Office (Wistaria). I know he was a gentleman greatly respected at the time and spent his time in the interest of Fossils and mineral research about the beach and cliffs”. Belonged to Miss Hyde and rented by William Holly. Pump in kitchen with date 1611. Pump has been removed. License of Coach and Horses removed to Wistaria House during the rebuilding of Pub. George Holly went to live at Charmouth House which he was carrying on as a Lodging House in conjunction with Coach and Horses. Harry Stamps father lived here. Before he went to Wistaria, William Holly lived at Gresham House where he was agent for L. & S.W. Railway company. He bought the Axminster Bus from Wilson of Portland House, when he moved to Luttrell House he gave up his grocery business. William Holly, was one of the sons of George Holly opened a Post Office in Wistaria, where it was to remain for 40 years. His father had rented it from Miss Hyde and it was briefly used as an Inn whilst The Coach and Horses was rebuilt after a disastrous fire. When he died in 1886 his son William, then living at “Bayville House,” took over the premises. He was already agent for the L.S.W. 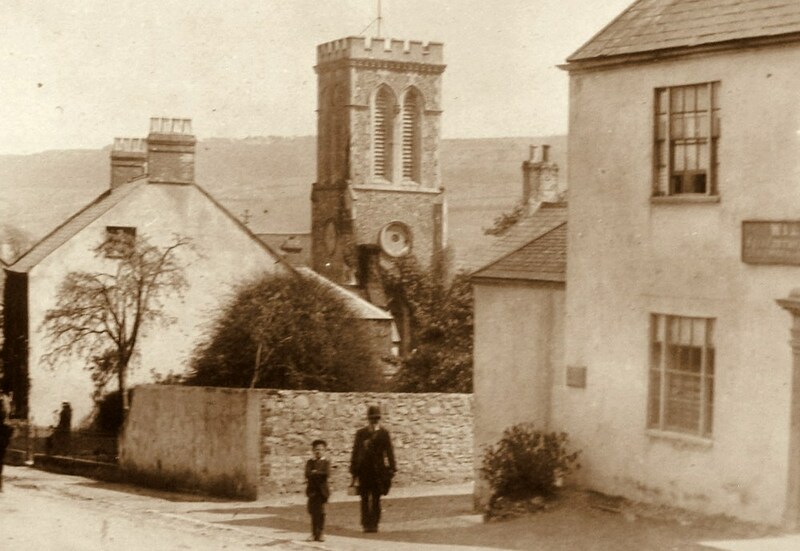 Railway Company and transferred his horses and 'buses from the stables behind the Knap at the corner of Higher Sea lane. He let a room, as branch office to the Wilts and Dorset Bank and later built an annex which was used by the bank, It was then taken over by Lloyds Bank until their premises were built in 1930. 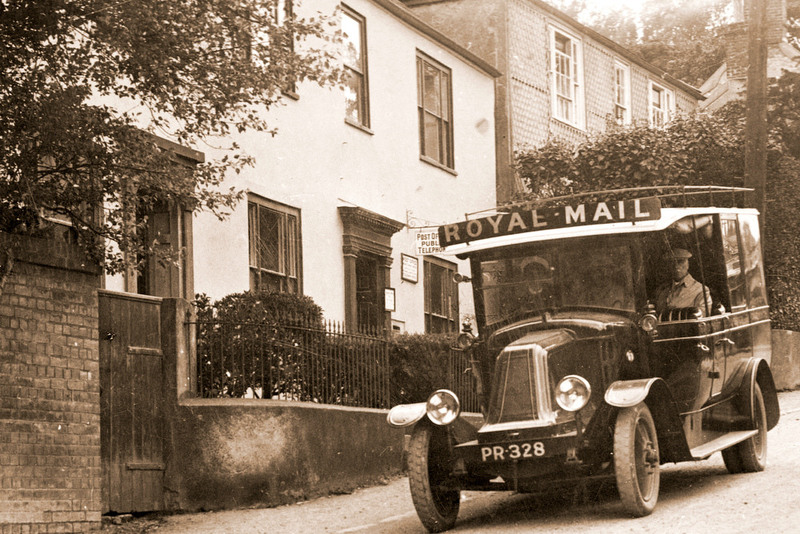 When Holly sold his buses to Morgan in 1896 he became Postmaster. And for forty years “Wistaria” was the Post Office. William his eldest son, after an absence from Charmouth, returned to help his father. When the Post Office was moved to Coles' shop at “Devon Edge” on the death of William Holly senior in 1931 he opened a stationery shop. He died in 1953 and for a short while it was the County Library. The premises were purchased by Childs and Son, who transferred their ironmongers business and enlarged the shop. He is chiefly remembered as proprietor of the Axminster 'Bus. He owned two 'buses, a wagonette, a carriage and six horses. The 'buses had seating accommodation for two passengers by the side of the driver, four behind and occasionally a third row for four passengers could be bolted on the roof which normally was used for luggage. Inside there were seats for six people. When fully loaded there, would be sixteen passengers and a third horse became necessary, which was ridden by Johnny Holly the youngest son, he returned when the 'bus reached the top of Greenway Head. Every week day the 'bus left “Wistaria” just before 9 a.m. and drove to the Mill where it turned and made its way through the village taking on board passengers and parcels, arriving at Axminster Station in time for the 10.2 a.m. down train and 10.15 up train. 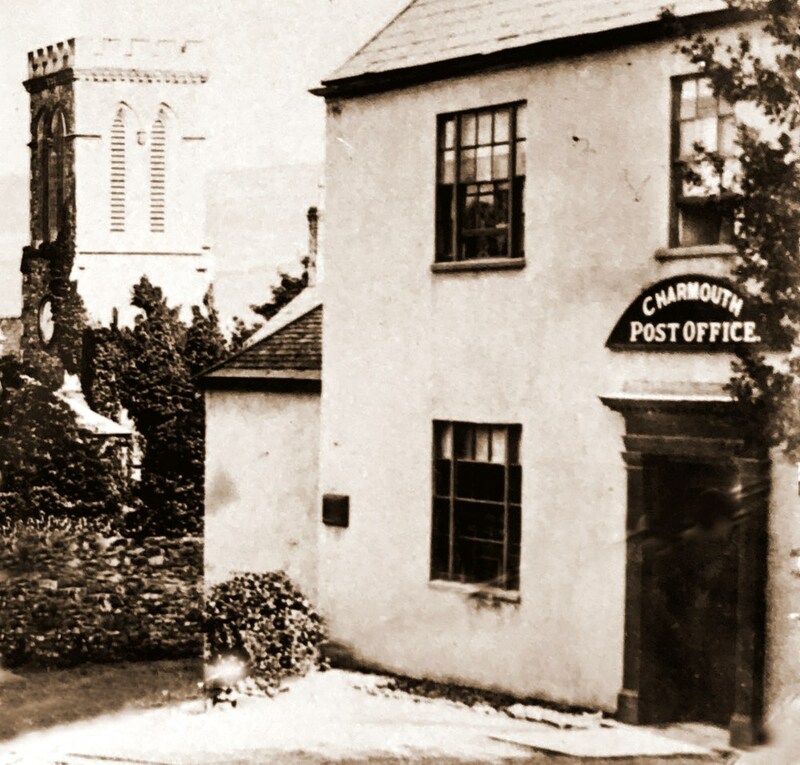 It waited in Axminster until 3-15 p.m. for the Waterloo train and reached Charmouth at about 4.30 p.m. ' William Holly and his son William both drove the 'bus. In summer a wagonette often accompanied the 'bus and a wagon to hold the luggage.